Certified Technician School | Power-Tronics, Inc.
Beginning in 2015, Power-Tronics, Inc. began offering a new program for customers designed to improve understanding of all Power-Tronics' products, increase awareness of available applications, and provide troubleshooting training for voltage regulation systems on a wide variety of electrical generators. Few generator servicemen today are able to quickly and efficiently troubleshoot or repair a generator on the spot, under pressure from the customer or from time constraints. 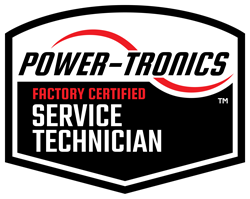 In an effort to improve servicemens' knowledge and equip them with the tools to deal with industry challenges, Power-Tronics, Inc. offers the new Factory Certified Technician School. PTI's CTS School will equip technicians with troubleshooting and repair techniques and a better knowledge of our products, effectively facilitating better communication between ourselves and technicians and between technicians and their customers. Techniques and knowledge afforded by the CTS School result in higher profits for your company, a better reputation for your service staff and a simpler supply solution with a minimum of stocked items in your inventory. Must have a minimum of 5 years of "Hands-On" experience working on generators, have a basic understanding of electrical theory, and understand how to read an electrical schematic. Must attend a factory product and troubleshooting school once every 5 years for renewal of certification. Must pass a written exam at the end of the Factory Certified Technician course. Certification is issued only to the person attending and completing the product and troubleshooting school. Companies that employ factory certified technicians are eligible for special additional discounts on our products. Certified technicians are given priority for troubleshooting and engineering assistance from Power-Tronics, Inc. Please use the button below to view or download a course syllabus for Power-Tronics, Inc.'s Factory Certified Technician School.